Stock # 3425, Manual, 34640 mi. Owner - Miracle Autosport LLC - CALL ERIC OR MATT AT 609-587-1986 WITH QUESTIONS OR TO REQUEST A FACETIME WALK AROUND! WE ARE TAKING A NEW APPROACH TO OUR ADS, RATHER THAN A LONG MULTI PARAGRAPH LISTING THAT MOST PEOPLE DON'T READ, I AM GOING TO POINT OUT THE HIGHLIGHTS AND CONDITION IN A LIST FORMAT. THE AD IS WRITTEN AFTER I TEST DRIVE EACH VEHICLE AND OUR SERVICE DEPARTMENT COMPLETES AN INSPECTION. IF THERE ARE ANY ADDITIONAL QUESTIONS FEEL FREE TO GIVE US A CALL! -Bought from a private collection! 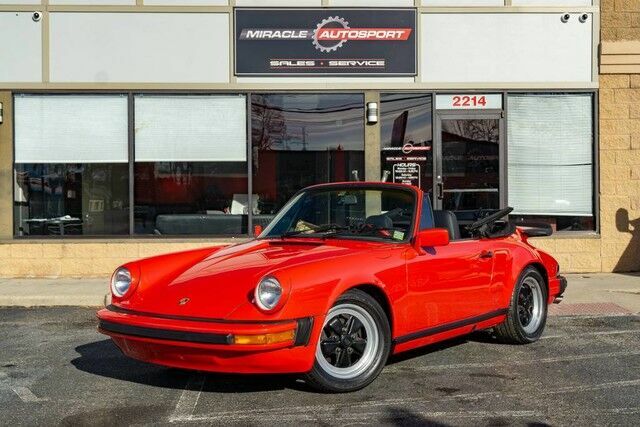 -Convertible conversion done in the mid 80's professionally and the factory turbo wing was added at that time! -Extremely rare car!!!! -Great color combo!!! -Freshly restored in 2015 and looks pristine! -The top is a factory 1986 setup so it is truly factory looking -Great Set of tires -Body and interior are in insanely good shape! -Custom audio system! -When I took it for a test drive it performed exactly as it should, I noted nothing for the shop to address based on a 10 mile drive! Click below for our video https://youtu.be/7msSXBsn2fc Click below for video done in 2016 by the prior owner https://www.youtube.com/watch?v=s1tjhLF5fZA OUR TERMS: -Additional Fee: $395 doc fee for all deals. Out of state pays $51 for title work, in state pays sales tax and actual cost of title/tags. We also have an optional prep fee of 285, this would give you a fresh detail, oil change. -Payment Type: Can be made by cash, check or wire. If paying by card please call us in advance. -Payment Time: Deposit due immediately (vehicle cannot be held without deposit), balance due within 5 days -Free Shipping: At the asking price we include 500 miles of shipping. -Shipping Terms: We offer shipping assistance as a courtesy, we rely on 3rd party carriers so it can take some time to coordinate -Storage: We will store a car for 7 days and then a $25 per day fee is charged unless discussed prior, or if there's a shipping delay My name is Eric and I am the owner of the dealership. My sales manager Matt and I are available to answer questions 7 days a week. You can reach us in the office during the day at 609-587-1986 or by email in the evenings. If you have a question at 11 at night, shoot me an email! We have been selling cars on ebay since 2006 and am, first and foremost, are car enthusiasts. I promise we will do everything we can to make sure you will be happy with your experience here at Miracle Autosport. We are a dealership set up with online sales as a primary focus. We are not some huge dealership with huge inventory but we are also not a cubicle somewhere with a license hanging on the wall. I started the business in a 150 square foot office with a 15 car lot and have grown into a 2500 square foot office with 3000 square feet of shop space, with 4000 square feet of indoor showroom space and I have done that one happy customer at a time! We have our own service department that focuses only on vehicles we sell, both before sale and after. Give a call or stop on by and talk cars with us, we are all enthusiasts here so you will never be pressured into something. We just like to talk about cars and love having new people to talk about them with! Come on in and give us a chance to show you a truly easy process this can be! If you have any additional questions please let me know! 609-587-1986 and ask for Eric or Matt. Give us a call at 609-587-1986 or e-mail and we can answer any questions you might have. Please be sure to read the complete ad as well as the terms and conditions and be sure you can meet them before submitting an offer. Your Thank You for your interest in our ad. .